My choice of a masterpiece was almost missed. 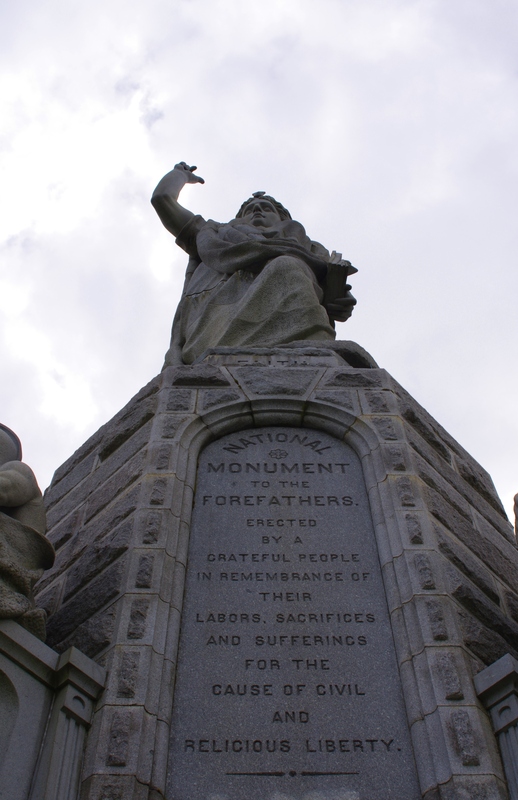 Nestled in a neighborhood, on a hill, overlooking Plymouth Bay, stands the National Monument to the Forefathers. My brother-in-law suggested that we see it, otherwise I might have overlooked it on my trip to Plymouth last Spring. I’m glad I didn’t! Standing at 81 feet (24.69 meters), the sometimes called “Forefathers Monument” is the largest, free-standing, granite monument in the world. Primary designer and sculptor, Hammatt Billings of Boston, originally planned the monument to stand at 150 feet (just one foot shorter than the statue of Liberty). However, a reduction in height occurred due to a shortage of funds during the Civil War. 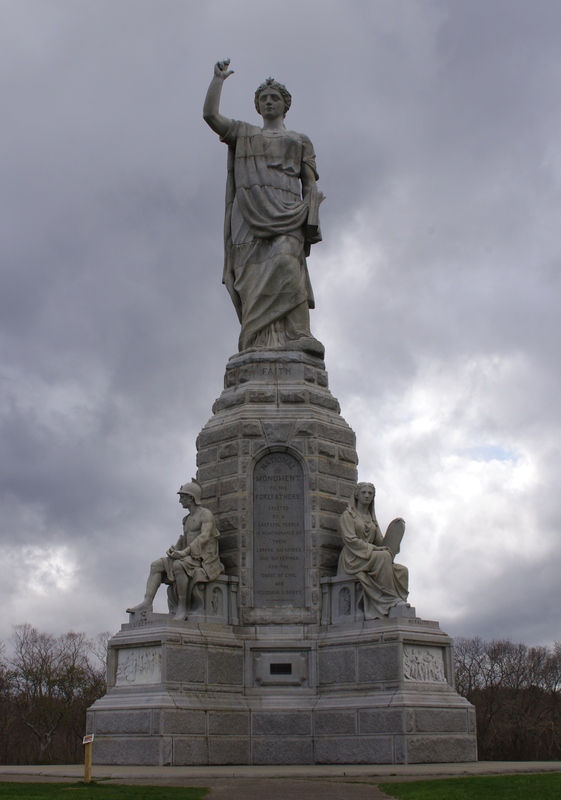 Standing atop the monument, “Faith” holds a Bible in one hand and points heavenward with the other. This part of the monument is 36-feet-tall and weighs 180 tons itself. Four buttresses, each with a 15-foot-tall figure, jut out below. These represent the virtues of Liberty, Morality, Law, and Education, all core values of the Pilgrims, who settled in Plymouth in 1620. 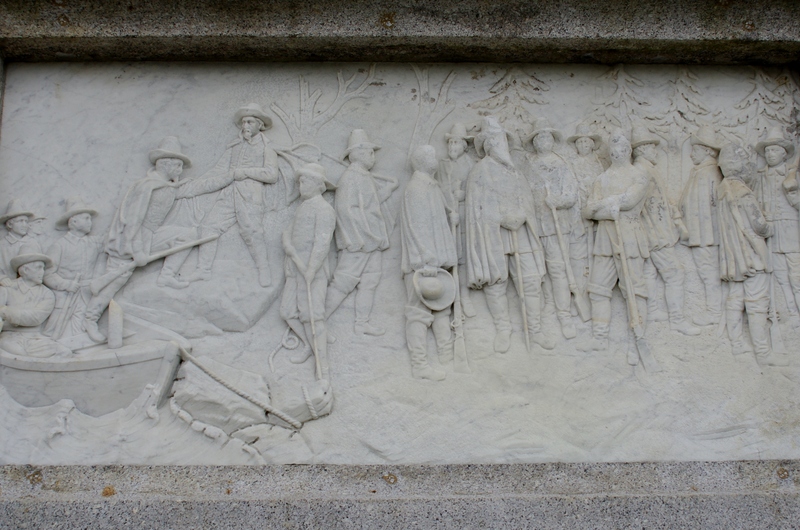 Bas-relief sculptures are found beneath the four figures, depicting scenes such as the Pilgrims departing England, landing on the shores of Plymouth and encountering Native Americans. 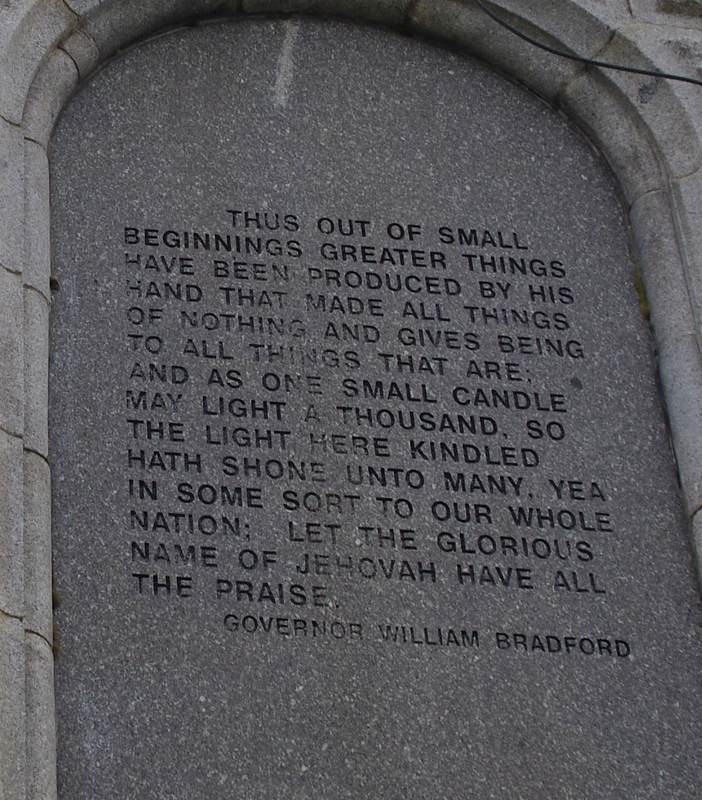 In addition to the dedication panel (see right), three other panels feature the names of the Mayflower passengers and a quote of William Bradford, Governor of Plymouth Colony (see below). 1 Now faith is the reality of what is hoped for, the proof of what is not seen. 2 For our ancestors won God’s approval by it. 3 By faith we understand that the universe was created by God’s command, so that what is seen has been made from things that are not visible. 4 By faith Abel offered to God a better sacrifice than Cain did. By faith he was approved as a righteous man, because God approved his gifts, and even though he is dead, he still speaks through his faith. 5 By faith Enoch was taken away so he did not experience death, and he was not to be found because God took him away. For prior to his removal he was approved, since he had pleased God. 6 Now without faith it is impossible to please God, for the one who draws near to Him must believe that He exists and rewards those who seek Him (Hebrews 11:1-6 HCSB). Just as the Hebrew forefathers won God’s approval for their exercise of faith in Him (v. 3), our country’s forefathers won the approval of God for their faith. Had it not been threatening rain, I would have enjoyed lingering longer at the monument. Our brief time there seemed more poignant because of the timing of our visit – the week of the Boston Marathon bombing – and Plymouth’s closeness to Boston. The freedoms we have in the United States did not come easily. Due to forces within and without, there is an erosion of some of those freedoms. We cannot take our civil and religious liberties lightly, knowing the great sacrifice demonstrated by our forefathers to secure them. However, my faith in the same God that the Pilgrims trusted by faith gives me an abiding, eternal security that no government can truly offer and no person can take away. Having come from countries in which “state” religion placed limits on the rights to assemble for worship, preach and express religious dissent, our forefathers knew that it was incumbent upon them to secure these rights. It is equally critical for us to continue to fight for the preservation of these rights as a secular society tries to marginalize and silence the voice of modern day dissenters. We need to pray for those who oppose recent legislation that contradicts religiously held values (i.e., Christian owned companies compelled provide coverage for abortion-inducing drugs in its healthcare plan). We must continue to be the voice for the voiceless (the unborn) as they have been deemed expendable by a Supreme Court ruling. We must continue to speak up for the sanctity of marriage and the biblical ideal of a one man/one woman, lifelong commitment. Because we do take our religious freedoms for granted, we are becoming more in danger of losing them. Failure for us to preserve these rights may one day cause us to fall into the intolerant mode of state that either sponsors one religion (a mode into which Egypt has quickly moved, imprisoning Christian converts) or one that prohibits any expression of faith. In what ways does religious freedom impact your daily life? What are some of the challenges you have experienced in the exercise of your religion? What are you doing (or think you should do) to preserve this freedom? 1 Hobby Lobby’s opposition to provisions in the Affordable Health Care Act is a potentially landmark case for the preservation of religious freedom, according to Rick Warren. See article HERE. 3 Again, The Ethics and Religious Liberty Commission reports on challenges to this issue HERE and other places on its website.